T04E T3 T3/T4 Turbo Kit Cast Turbo Manifold For Golf GTI Jetta 3.2L 2.8L VR6 24V. 02-08 Volkswagen Golf 2.8L VR6 24V Engine. 99-04 Volkswagen Jetta 2.8L VR6 24V Engine. All Vehicles Run with Volkswagen 2.8L/3.2L VR6 24V Engine. 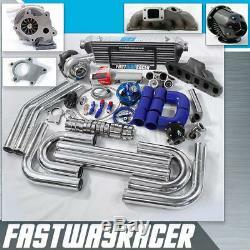 This turbo kit perfect upgrade your car and get more boost. Your car will gain 100-150HP if you set at 7-15PSI. Customers require upgrade the fuel pump, injector and ECU to tune the car if you set at higher PSI. This kit can max up to 350HP. We offer "FASTWAYRACER" license plate and "FASTWAYRACER"sticker as free! Downpipe Flange: 2.5 5 Bolts Flange. Type of Bearing: Journal Bearings. Cooling Type: Oil Cooled Only. Turbine Wheel Diameter: 54.06MM/65.20MM. Compressor Wheel Diameter: 50.16MM/76.84MM. Brand new VOLKSWAGEN 2.8L/3.2L VR6 24V cast iron turbo manifold. Made of high quality cast iron. Allows power steering and air conditioner. It is good for huge horsepower increase along with improved more air flow, gain 10-15HP. T3 turbo flange fits T3 or T3/T4 turbo chargers, and fits 35MM/38MM turbo wastegates. 2.5 5 BOLT DOWNPIPE FLANGE. Brand new 2.5 5 BOLT DOWNPIPE FLANGE. Made of high quality T304 stainless steel. Direct bolt on this turbo charger. You can use this flange to weld one pipe, and custom make the downpipe for this turbo kit. UNIVERSAL 2.5 PIPING KIT. Brand new universal 2.5 polished aluminum piping kit. Made of high quality T6061 aluminum. THIS PIPING KIT IS UNIVERSAL, IT IS NOT BOLT ON TYPE. CUSTOMERS NEED TO CUT AND BENT THE INTERCOOLER PIPE TO FIT YOUR CAR. 27"X7"X2.5 FRONT MOUNT INTERCOOLER. Brand new universal 27"x7"x2.5 front mount intercooler. High flow and light weight. Support up to 400HP and 35PSI. Compress air flow rate: 700cubic feet/min. Pressure drop: 0.2-0.5 at 15PSI, 2-5 at 35PSI. Full size: 27"x 7"x 2.5. Core size: 21"x 7"x 2.5. SSQV TURBO BLOW OFF VALVE BOV. Brand new SQV turbo blow off valve bov. Made of high quality CNC billet aluminum and andized finished. Including O-ring, hardware and flange. Our blow off valves is a dual stage pull-type relief valve. Unlike typical push type blow-off valves, will not leak under any level of boost. It is for maximum performance, incorporates both a small primary valve for ultra quick activation, and a larger secondary valve for additional discharge capacity. It is constructed of billet aluminum, which ensures long-term durability and a high luster look. Brand new universal 38mm wastegate, made of hight quality stainless steel hardware, mating weld flanges are 304L. Set at 7 PSI, comes with two extra 11PSI and 15PSI springs, fully adjustable. Only 4.35 tallgood for customer working with tight engine compartment. Accurate boost pressure, Ultra durable diagram. Brand new universal 35mm/38mm wastegate turbo dump pipe+elbow, made of hight quality stainless steel. Easy clearance in the engine bay, redirect the hot exhaust gas from the wastegate towards the bottom of the engine. Reducing temperature inside the engine bay. Make a very distinct and loud release of air. Brand new 10AN oil drain/return line kit, made of hight quality stainless steel braided line and T6061 aluminum fitting. Helps circulate oil from the turbo to the oil pan. Brand new oil feed line, made of hight quality stainless steel braided line. Special designed inlet adapter limits oil flow, effectively prevent blown oil seal caused by excessive oil pressure. Comes with one 1/8 NPT male fitting and one 4AN male fitting. Has restriction build in, offers proper oil feeding to the turbo charger. Brand new fuel pressure regulator. Made of high quality CNC machined aluminum. Includes hardwares and hoses for installing. Adjustable 0-140 PSI(0-10kg/cm²) for maximum fuel pump capacity. Brand new turbo boost controller. Made of high quality CNC machined T6061 aluminum with anodized finish. Comes with hardwares for easy installing. Allow you to adjust PSI ratings(1-30PSI)without changing the wastegate springs as well as replacing the wastegate springs. Brand new oil catch tank. Come with aluminum bracket, hose and stainless steel clamp to mount your new reserve tanks. Dimensions:6.25"x3.25"x3.25";Hole inlet size:0.3";Hold up to 750ML. Brand new pen style turbo timer. A turbo timer is a device designed to keep an automotive engine running for a pre-specified period of time in order to automatically execute the cool-down period required to prevent premature turbo wear and failure. A turbo timer can be programmed to leave the engine running for a pre-specified period of time even after ther driver has exited and locked the vehicle. After a period of driving when a turbocharger has been working hard, it is important to let the engine run at idle speed for a period of time, allowing the compressor assembly to cool from the lower gas temperatures in both the exhaust and intake tracts. At the same time the lubricating oil from the engine is able to circulate properly so the turbine won't burn the lubricating oil that would otherwise be trapped within the charger with the turbine rotating at high speed. Brand new universal 2" BOOST GAUGE+2" AIR/FUEL GAUGE+OIL PRESSURE GAUGE+RPM GAUGE. Made of high quality, light design. Clear and bright LED display when it is on. Professional installation is highly recommended! Item exactly the same as picture shown. Item color maybe different from picture depending instock. PLEASE CHECK THE PACKAGE BEFORE SIGN FOR IT. We guarantee all our products are 100% brand new. Some of our products are for "off-road" use only. We highly recommend professional installation for all products. Installation instructions are not included for some products. We only accept return package with the original packaging (Box and Label). No claims can be filed over 18 days after package has been delivered. We will try our best to reply all e-mails within 24 hours, there might be some delay during weekends and holidays. The item "T04E T3 T3/T4 Turbo Kit Cast Turbo Manifold For Golf GTI Jetta 3.2L 2.8L VR6 24V" is in sale since Wednesday, September 2, 2015. This item is in the category "eBay Motors\Parts & Accessories\Car & Truck Parts\Turbos, Nitrous, Superchargers\Turbo Chargers & Parts". The seller is "originmotorsports" and is located in City of Industry, CA. This item can be shipped worldwide.